Scrapbooking can be great! There are so many papers and embellishments to choose from you’re sure to find something that suits your style! With all this choice, it’s easy to get overwhelmed. 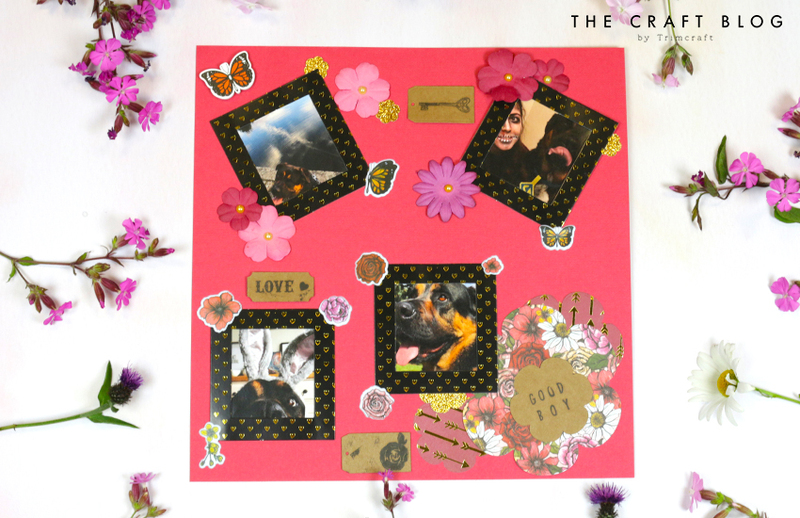 Follow our simple steps to create a stunning layout and become a scrapbooking master! 1. Let’s start simple with a plain Dovecraft cardstock. We’ve chosen pink as it best compliments the Folkland papers. 2. Let’s add some interest. Using the First Edition Nesting Bloom dies, cut out different sizes of flowers in a range of different paper designs. We’ve used the Folkland 8” x 8” papers and gold glitter card. 3. Arrange and stick these flowers in the bottom right corner. 4. It’s time to give the page a title. Cut out another flower using the nesting bloom dies and add a quote or phrase that sums up the photos you have chosen. Since the photos are of our dog, we chose ‘Good Boy’. 5. Time for photos! Print out 4 8” x 8” images you love from your instagram and stick them in the Dovecraft Folkland photo frames. 6. Stick these around your scrapbook layout leaving some space for embellishments between each one. 7. Last but not least, let’s decorate. We’re using the Dovecraft Folkland stamps and dies, puffy stickers and paper blossoms in complimentary colours. Use a few of each around each photo for added interest and you’re done! With these steps you can create so many different layouts. You can add or remove steps, there is really no wrong way to do this! Here we have used the Hey Baby papers to create an adorable layout for some doodles. If you’re not sure about your layout don’t stick it down. Just place the photos and embellishments where you think you want them, take a photo and try another. Then just flick though the pictures and pick your favourite. If you don’t want to damage your photos, washi tape is your new best friend! It’s perfect for sticking your photos down without having to permanently damage them. If you want perfect lettering quickly, use alphabet stamps on an acrylic block. It’s super easy and gives you perfect results every time. Are you going to try creating a scrapbook layout? We’d love to see you lovely designs over on the Inspiration area and don’t forget to #Trimcraft when sharing to social media! Most importantly, stay inspired and keep crafting!